There’s always something fun happening at Stampin’ Up! Check back here regularly to see our latest special offers. Last-Chance Products: Get Them While You Can! It’s that time again: we’re retiring select products from both the annual and occasions catalogs. These last-chance items will be available until June 3 or while supplies last, so be sure to visit the online store before these products are going, going, gone! Paper Pumpkin has teamed up with Shelli Gardner, Stampin’ Up!’s cofounder and board chair, to bring you a special edition Paper Pumpkin kit in May. You’ll love the one-of-a-kind box and all of the vintage delights inside. Don’t miss it. 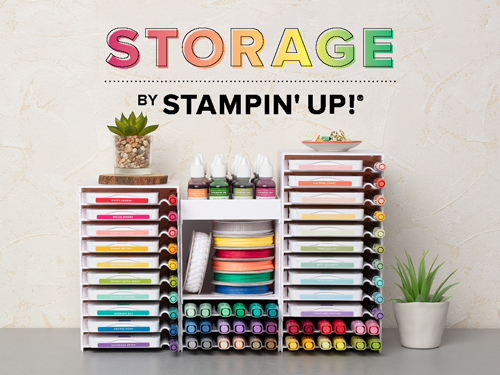 Get ready to organize and customize your space your way, because Storage by Stampin’ Up! is available now! Our new product line of modular storage solutions lets you get creative and make your space completely you. You can mix and match, add more storage pieces, stack them high, or spread them out—it’s up to you! Shop Storage by Stampin’ Up! Discover new products—including our brand-new cling stamps—and join us in celebrating 30 years of loving, living, and sharing! With Sale-A-Bration happening right now, it’s also the perfect time to earn rewards just by purchasing items from the occasions and annual catalog. Nothing beats stamping with the Stamparatus, and now you can take your Stamparatus anywhere with ease and in style using the Craft & Carry Stamparatus Bag!